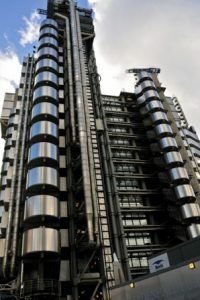 The Lloyds Building is a stainless steel and glass edifice with its services, such as ducting and lifts, housed on the outside of the building. This results in a phenominal cost for maintenance because these components, which are normally protected by the fabric of the building, are exposed to the elements; however on the positive side, because the building is funded by the insurance market (i.e. you and me) it won’t be falling down any time soon. The building consists of three main towers and three service towers clustered around a central retangular space. It was designed by Richard Rogers and houses underwriters in the specialist insurance market. The Lloyds Building is not normally open to the public. However it is often open for two days in September during the annual London Open House event (22 and 23 September 2012).